Where did all that new commerce and marijuana tax money go? K.M. 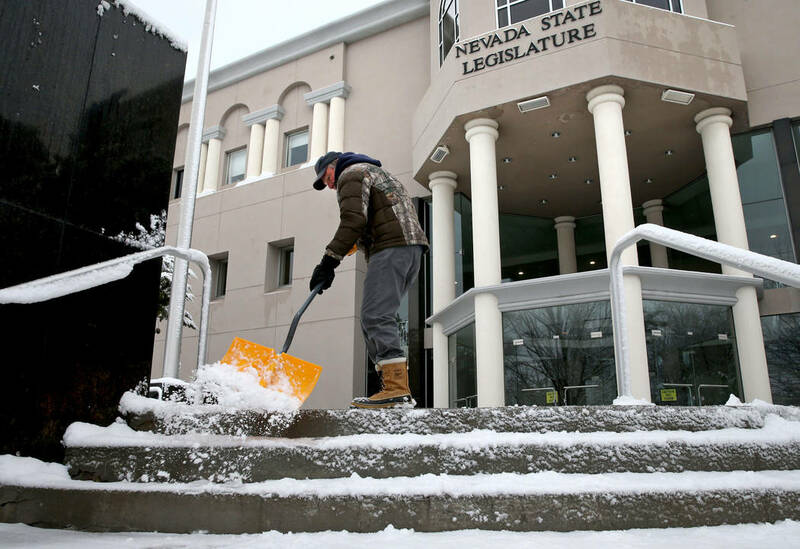 Cannon/Las Vegas Review-Journal Randy Bird shovels snow in front of the Legislative Building in Carson City on the first day of the 80th session of the Nevada Legislature Monday, Feb. 4, 2019. According to reports published for the last several years that rank K-through-12 education systems across the U.S., Nevada schools consistently rank last or near last in every category including student performance and per student funding. During every new legislative session, the governor’s office proclaims that fixing our state’s education system is a high priority. New taxes and fees have been passed the last two sessions and the voters were promised that the money was going to help solve our education problems. But is that what happened with those new taxes and fees? Where is all the money going from the marijuana taxes and the commerce tax? Those new fees and taxes were supposed to help “fix” our education system by increasing funding levels. So, is the money from the marijuana tax going to education? That depends on who you ask and what tax you are asking about. A 15 percent wholesale tax on distributors was passed as part of ballot question 2 to legalize recreational marijuana. “That money is going to education after paying for administrative costs,” Sen. Tick Segerblom said during the 2017 session. By state Constitution, those dollars are going to education. But the amount of money from the marijuana tax is only a small part of the overall education budget. The distributor marijuana tax revenue for schools is projected to be $26 million in 2019. The state’s education funding is $1.6 billion. For 2018 it amounted to 1.5 percent of the money in the Distributive School Account and it is projected to be 1.4 percent for 2019. During the 2017 legislative session, the tax structure for medical marijuana was changed, adding an additional 10 percent retail excise tax raising an estimated additional $75 million in revenue. The 15 percent tax approved by the ballot measure still goes to education, but the additional 10 percent tax goes to the state’s rainy-day fund. In 2015 the Nevada Legislature passed the commerce tax. The commerce tax is an annual tax imposed on businesses with more than $4 million in gross Nevada revenue in the last year. For 2017, according to the Nevada Department of Taxation 147,191 businesses filed a commerce tax return and 6,731 businesses paid the tax. The tax revenue from the commerce tax goes into the state’s general fund. The state’s general fund provides the income for the Distributive School Account, where the state pays its share of per-pupil school funding. According to the Guinn Center’s 2017-2019 Nevada Budget overview, the general fund was projected to be 30.3 percent of the state’s biennium revenue. K-12 education is the largest spending category within the general fund, totaling 35.8 percent and the higher education system total is 15.4 percent of the fund. Since the commerce tax goes into the general fund and about one-third of that fund goes to K-12 education, you can conclude that about one-third of the commerce tax goes to education. Nevada spends a statewide average of $8,960 per student, according to the 2016 Annual Survey of School System Finances, U.S. Census Bureau. Of that amount, we spend $5,183 on instruction. That per student average places Nevada 40th in the nation, one of the few categories that we don’t come last in for education. Since the introduction of the marijuana and commerce taxes, we would expect that the per-pupil amounts will have increased over 2016 levels, perhaps raising our national per-pupil funding levels rank.